The Chicago angle grinder injury attorneys of Rosenfeld Injury Lawyers LLC help injured workers recover the compensation they need to cover the cost of medical bills, lost wages and out of pocket expenses following a tragic workplace accident. Whenever equipment defects or faulty designs result in the malfunction of a device, it is possible for victims who have been harmed due to the defects to recover compensation from the manufacturer in addition to any benefits they may receive from their employers in the form of worker’s compensation. If you have been injured, we can help you learn more about your rights and options. Angle grinders can be equipped to serve many different functions and to operate with a wide variety of materials. Their general purpose is to cut, grind, smooth and polish the materials they are used on. Most of these devices are handheld and can be powered through compressed air or an electric motor. They are highly adaptable for different environments due to their ability to be equipped with different blades and discs which can be comprised of diamond, wire brush, stone and other materials designed for the purpose at hand. Popular angle grinder brands include Makita, Home and Decker, DeWalt, Hardin, Ingersoll Rand, Bare-Tool Hitachi, Bosch, Milwaukee and King Arthur’s Tools. While the dangers associated with angle grinders are well known, there is an expectation that these devices will operate as anticipated and that their safety features will help to reduce the chance of an accident or to mitigate the severity of the resulting injury. The injuries that may result from a defect can include the following. Injuries to the eyes— most of the injuries that occur to the eyes result from flying debris and can be mitigated through the use of protective eyewear, but larger pieces of stone, metal or other abrasive materials can easily cause injury regardless of whether eye protection is worn. Amputations— there are a number of reasons a victim would require amputation, including irreparable disfigurement, infection and the loss of the limb or digit during the accident. Lacerations— the person working with the grinder or those in the area may be cut by the grinder’s plate or the debris that is produced. There are instances where flying pieces of wood, stone or other material can cause deep cuts which require immediate medical attention. Burns— side grinders can become very hot while in use and it is possible for the worker to be burned if the equipment overheats or the safety guard fails. Burns can require extensive care and leave disfiguring scars that remind the victim of the accident for the rest of his or her life. Injuries to the feet— it is also possible for the worker to injure his or her foot with a defective angle grinder, which could result in permanent disability. In addition to recovering the worker’s compensation you are guaranteed for your injuries, our attorneys can help determine whether your accident was the result of a defect in the equipment you were using. Product liability laws allow victims to recover compensation from equipment manufacturers when their products injure workers due to poor design or an unanticipated failure. If your worker’s compensation benefits are not sufficient to cover the entire financial impact of your injury, pursing damages from the device manufacturer is another way to ensure that your needs are met. Rosenfeld Injury Lawyers LLC is a leading representative of injured workers throughout Illinois and we have helped thousands of clients recover the maximum amount of benefits that the law will allow. 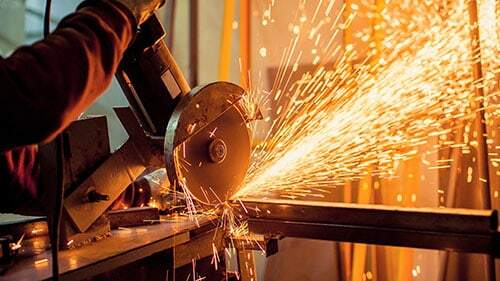 If you have been injured in a side grinder accident, contact us today to arrange a free consultation with one of our award winning Chicago angle grinder injury attorneys today to learn more about your rights and legal options. If we are unable to secure compensation on your behalf, you will owe us nothing.